I truly am in the minority when it comes to Sherlock. I recognize that. It isn't even that I am not a Sherlockian despite my hardest efforts. It's that while A Scandal in Belgravia has been hailed as the "Citizen Kane of Sherlock Holmes" stories (even topping anything that hack Sir Arthur Conan Doyle ever wrote), I found it sexist and intellectually vapid. Conversely, the majority view of The Hounds of Baskerville, Sherlock's second episode of the second season/series, is seen as almost a disaster, while it to me was actually much better than its reputation leads one to believe. Was Hounds of Baskerville brilliant? No, which must come as a genuine surprise to its writer, Mark Gatiss, who fancies himself a genius in every way. In some ways, it doesn't hold up (which frankly is a common element in Sherlock episodes, more spectacle for the dim-witted than actually clever). However, The Hounds of Baskerville has some good acting in it, along with some nice visual flares that push it higher. Henry Knight (Russell Tovey) comes to Sherlock Holmes (Benedict Cumberbatch), whose notoriety in regards to his detective work has been growing. He isn't too keen on the case Henry offers (having already rejected quite a few save perhaps for one involving a glowing bunny). 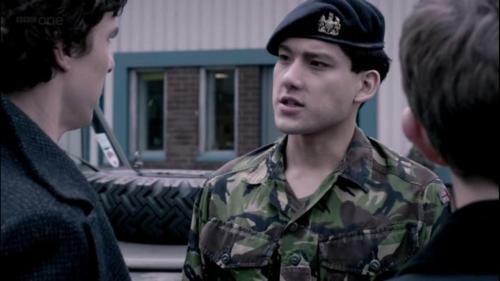 Henry tells him of the murder of his father 20 years prior, which he witnessed despite no body ever being found. Henry is still highly traumatized by the memories of it all. Ho-hum, thinks Sherlock, but it is the mention of a 'gigantic hound' that catches Holmes' attention. With that, Sherlock and his blogger Dr. John Watson (Martin Freeman) are off to Dartmoor, to look in on Baskerville and Dewer's Hollow, the scene of the crime, and perhaps the dwelling place of The Devil. The town has made financial hay of the Legend of the Hound, and it doesn't hurt that Baskerville is a super top-secret military base where rumors abound of the goings-on, a more secretive Area 51 if you will. Sherlock, thanks to a passkey he 'borrowed' from his snooty uptight smug brother Mycroft (Mark Gatiss playing himself), manages to get inside Baskerville where he meets a hostile Major Barrymore (Simon Paisley Day) and Dr. Frankland (Clive Mantel), who remembers Henry's father. One night in the moor, Henry and Sherlock appear to encounter the Hound, while poor John is temporarily distracted by someone apparently signaling in Morse Code. Holmes, quite shaken up by this, cannot admit that he has indeed seen the Hound, but his eyes tell him a different story. Watson, for his part, is now tired of Holmes' dismissive behavior towards everyone, including a highly traumatized and unstable Henry. 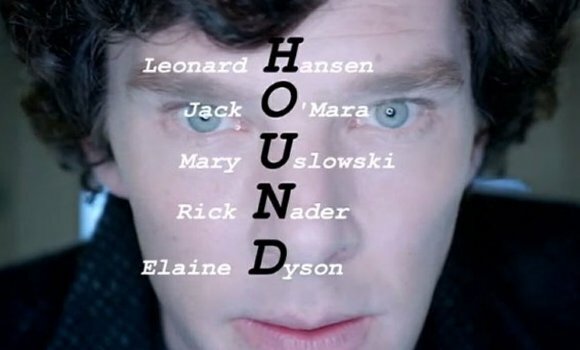 Holmes then suspects that 'Hound' isn't a literal animal, but an acronym, and with Inspector Lestrade (Rupert Graves) popping in 'unexpectedly', we find that Baskerville is hiding more secrets involving mind-altering drugs and experiments from the past, specifically in America (Liberty, Indiana, to be specific). As Henry soon starts slipping into insanity, Sherlock comes in time to rescue him and have both Henry's father's murderer and the Hound of Baskerville unmasked. In the denouement, we find that Mycroft has somehow decided (or coerced) to release Jim Moriarty (Andrew Scott) from his imprisonment, with the final shot being the word "Sherlock" written all over. Unlike Mark Gatiss, I never believed I was or thought of myself as a genius. I think of myself actually as a man of average intelligence. This is why in so many respects I think Hounds of Baskerville is typical Gatiss: it throws a lot at you and thinks its so clever when on closer examination it doesn't hold together (and this from someone who still stands by his view of The Unquiet Dead being among the best Doctor Who stories, which oddly puts me somewhat in the minority on the subject). First, I found the resolution to the elder Knight's murder far too convenient. What exactly WERE the chances that the murderer would ever-so-conveniently be wearing a shirt that not only read out HOUND but pointed to the location of HOUND's previous work? Furthermore, I question this in regards to the actual Legend aspect of the story. Fletcher (Stephen Wight) is a man who makes his living by showing tourists the haunts, and even claims to have seen the hound himself (which left a very large footprint as well). I am not accepting that this 'legend of the Demon Hound' sprang up within two decades (between Henry's first sighting--which I don't think would have sprung up a cottage industry from the ramblings of a child). I would imagine that this legend would have existed for generations (like in the original Conan Doyle story). I also have to think that Fletcher's statements of having seen the Hound are either lies or are true. If lies, then he made that footprint himself (as far as I remember, the story makes no mention of whether he did or not). If true, then he was under the influence of the psychedelic drugs and looked none the worse for wear. In short, something about the resolution just doesn't jive with me. Then again, I am of average intelligence and nowhere near the lofty intellectual heights of Mark Gatiss, so there it is. I also object when the audience is not given information that leads to the resolution. We have only one clue that the murderer was in America, a mention of 'cell phone' rather than the British 'mobile'. While I did notice this turn of phrase (and fail to understand why Holmes didn't), what I really don't get is if Gatiss took this from Murder on the Orient Express, which had Hercule Poirot come to the same conclusion about a suspect living in America based on the terms "long distance call to lawyer" versus "truck call to solicitor". Could our genius have ripped off Agatha Christie? Finally, how exactly does Sherlock fool the military into entering Baskerville twice considering that the super-secret key has a photo of Mycroft? I guess people don't really look at badges these days, and the military has no interest in keeping people out they suspect of having broken in the first time into their super-secret center for nefarious experiments. To sum up, story-wise I am not convinced that Hounds of Baskerville holds up logically. As a side note, I wonder if Sherlock is required to have an obligatory gay suggestion, a 'joke' that has long-ago worn out its welcome. However, the flaws within the story are more than made up by other factors. Paul McGuigan has a crafty visual flair that gives us that Gothic horror feel a supernatural story requires. Charlie Phillips' editing worked so brilliantly, the flashlights (torches in the U.K.) making the characters come closer and closer with every light-glare that flashes before us. The chaos of Henry and Sherlock seeing the Hound is excellently filmed, and the transformation of the sky as Henry talks about seeing the Hound and disbelief that Sherlock denies seeing it gives us that extra psychological edge. 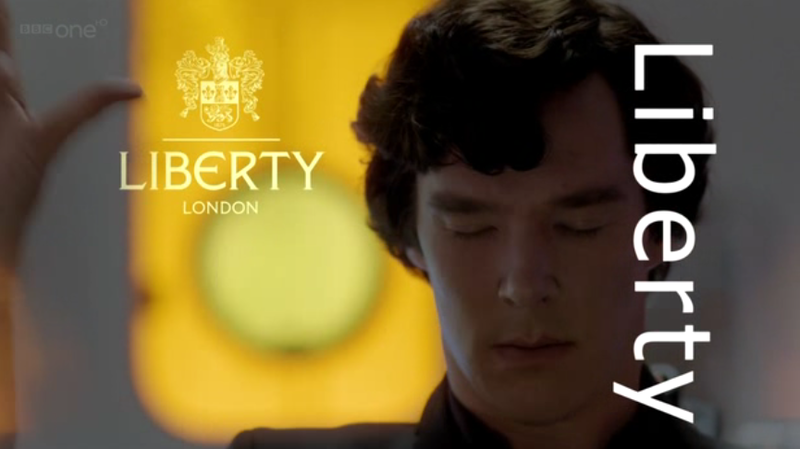 This, I believe, is the first time we go to Sherlock's 'mind palace', where we get an insight into how his mind works. Visually it is well-shot and highly interesting. We also have some great performances coming from the cast. Cumberbatch continues to make Sherlock into an insufferable arrogant jerk, brilliant but highly terrible to everyone around him. What was excellent about Hounds of Baskerville is that at least for a few moments, Cumberbatch allows us to see the thin cracks in Holmes. His frustration at trying to figure out what he had seen shows Holmes to be capable of both fear and anger at having fear. Freeman still has that bumbling Nigel Bruce-like manner to him, but at least here it was Watson who found an important clue that Holmes didn't. The real showcase is Tovey as the tormented Henry, a man hanging on to sanity by the thinnest of threads. I would say that in some ways The Hounds of Baskerville is not the cleverest of stories or a brilliant variation of The Hound of the Baskervilles. However, what flaws they have are made up for with brilliant editing and cinematography, along with some solid acting. The Hound of Baskerville is on the whole a story made better by its atmospheric elements and is hardly the dog I was led to think it was.